Up until a few days ago, Thanksgiving was nowhere on my radar. There was just so much going on for the past several weeks that I told myself if I could make it to Thanksgiving week in one piece, I’d be golden. It came down to the wire waiting for the final items on my checklist to come via post before we piled into the car. Two out of three isn’t bad considering it was the USPS (I keep my expectations low). Once on the road, the stress began to peel away with each additional mile. 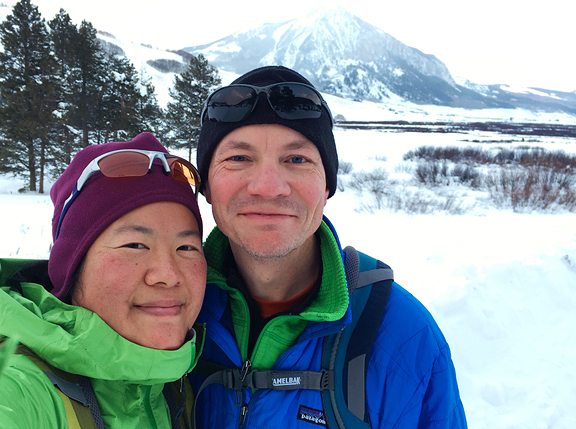 There were bighorn sheep sightings on Interstate 70, discussion of time-sensitive deadlines to address before 2015, much needed coffee to fuel the driver (Jeremy), and the question of what to eat for Thanksgiving. We agreed that we would keep Thanksgiving dinner simple: grilled rib eye steak with loads of vegetables. 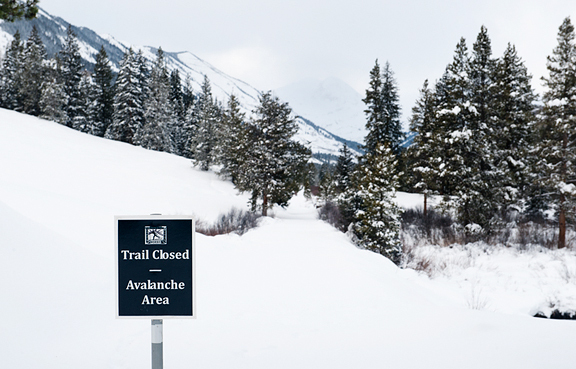 This week is dedicated to catching up on work and… skiing. 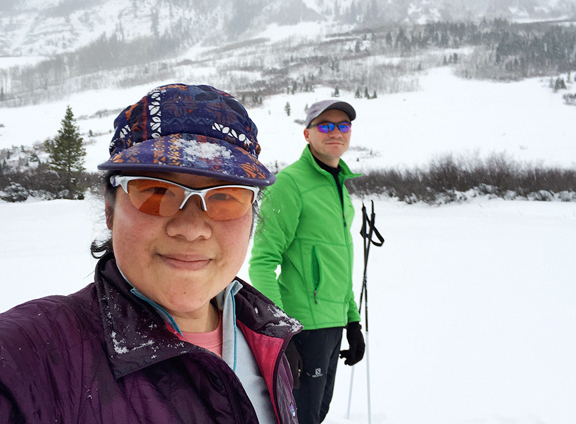 The snow in Crested Butte is quite nice for shoulder season. Yes, it’s still shoulder season – many of the local businesses are closed until 2 weeks before Christmas. Town slumbers quietly before the mad rush of the holiday ski season, but I like this lull. 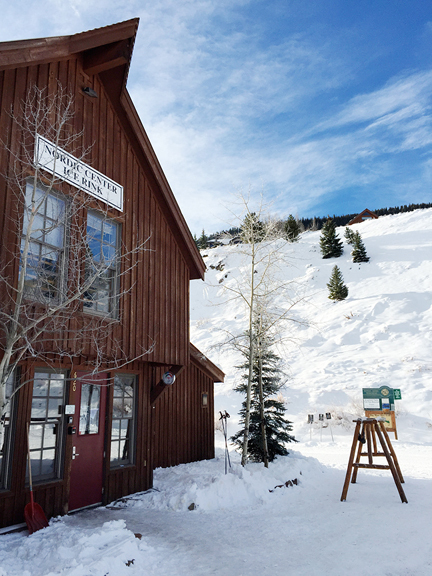 The big mountain opens Wednesday. 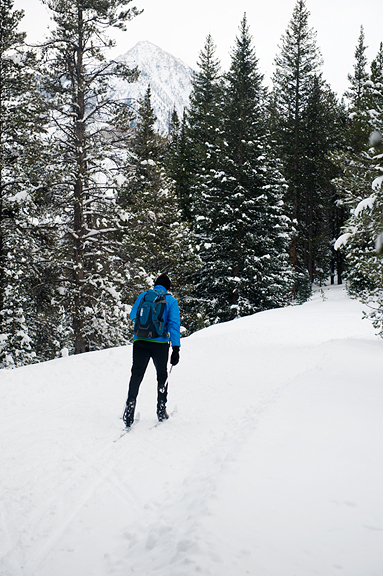 In the meantime, we’ve been getting our nordic muscles back in shape on fresh snowfall. Colorado’s high country changes so dramatically from summer to autumn to winter – green to gold to white. Winter is a bit of a hog as it eats up most of autumn and spring, but I don’t complain because I love it. It’s hard to believe that just last month I was back here in Crested Butte shooting the fall colors. Over the years I’ve learned that I feel physically and mentally better on the fall shoot if I eat my own food rather than dining out for the duration of the shoot. It’s healthier and more economical. But there are those times after shooting sunrise in the freezing cold when you get a text from fellow photogs relaying their intention to head into town for breakfast, and it sounds like the best idea ever. One of my favorite stops in the little mountain town of Ridgway, Colorado, is Kate’s Place, which serves up quality breakfast and lunch. My friend, Jimmy, always orders the biscuits and gravy. I’d never had it before, but Jimmy always has this blissful smile on his face when he gets biscuits and gravy. This year, I decided to give it a try. 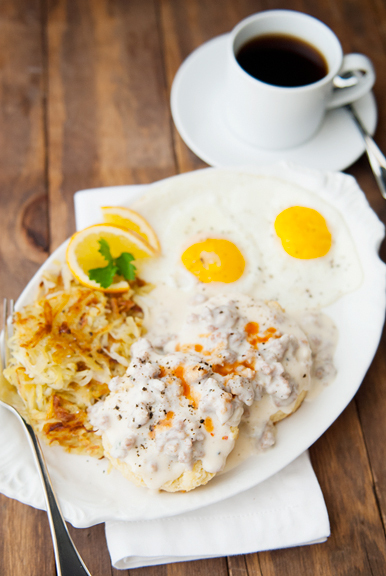 “Good, isn’t it?” Jimmy smiled, nodding at my plate of biscuits and gravy. Yes, it was damn good. Something warm and satisfying to fill my empty and cold tummy – energy enough for my drive back to Crested Butte. It wasn’t more than four weeks later when I began thinking about that breakfast. I blame Jimmy… and Brent – those two are always mooning over biscuits and gravy. Jimmy even texted me a photo of (another) plate of biscuits and gravy from elsewhere on the road. Well, let’s do this. Despite growing up in Southern Virginia, I did not partake of the biscuit culture. Country ham? Yes. Fried chicken? Yes. Chesapeake Bay blue crabs? Oh, hell yes! Sweet tea? Some. Biscuits? Not so much. It just wasn’t a thing in my Chinese immigrant household. As an adult, whenever presented with buttermilk biscuits, my first thought was “crumbly mess”. 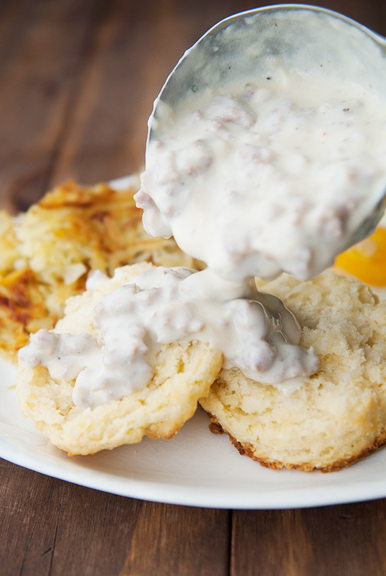 But fresh-baked buttermilk biscuits smothered in a sausage cream gravy is something else. Something wonderful. 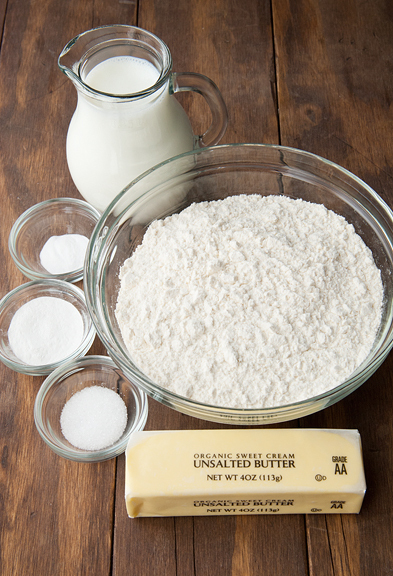 There are a bazillion recipes and methods for making biscuits out there, but this version is among the simplest and easiest. If asked to choose between crumbly and flaky biscuits, I opt for flaky every time. Flaky requires some extra work (and it’s worth it), but crumbly clearly has its place alongside gravy. 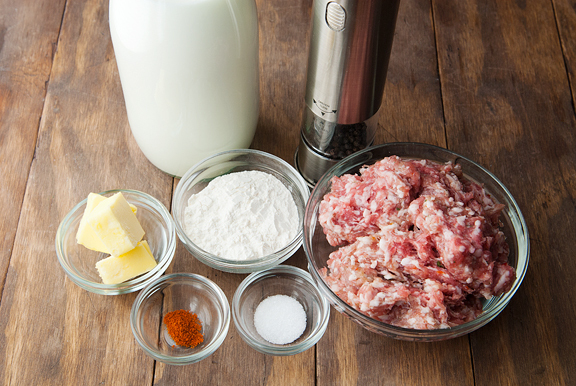 This sausage cream gravy is equally simple and easy, which means two things: 1) this recipe is a perfect breakfast to whip up in no time and 2) we are all going to have to run, ski, walk, hike, bike, or swim a little more. The default sausage here is breakfast sausage. I used to like Jimmy Dean’s spicy breakfast sausage until one fateful day in college when it laid me low for 24 hours. Now, I make my own from scratch which allows me to adjust the seasonings and spice to my liking. Alternatively, you could use something zippier like chorizo (homemade or store-bought). You’ll want the sausage in bulk rather than casings, but it’s easy enough to remove the casings if that is all you can source. Believe it or not, Jeremy had never had biscuits and sausage cream gravy until now – and he spent his childhood summers in Tennessee! Despite our inadequate exposure to southern cuisine, we are making up for it now. These delicate melt-in-your-mouth biscuits in creamy, rich gravy are absolutely heavenly. And they can be made ahead or saved as leftovers for two to three days. Just reheat the gravy on the stove or in a microwave and lightly toast the biscuits. But if you can serve them fresh, that’s the best way to enjoy them. 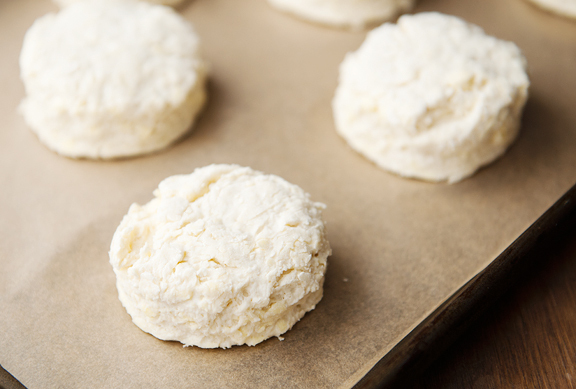 Make the biscuits: Preheat the oven to 425°F. Line a baking sheet with parchment paper. 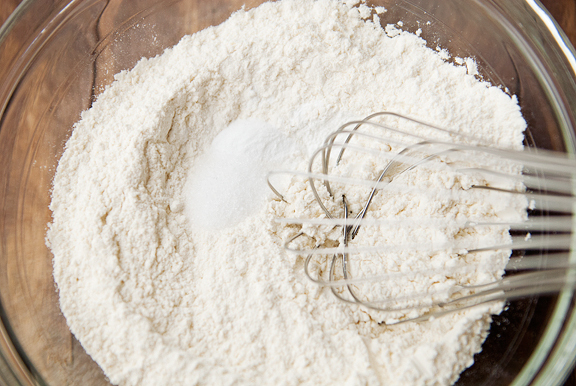 Whisk the flour, baking powder, salt, and baking soda together in a large bowl. 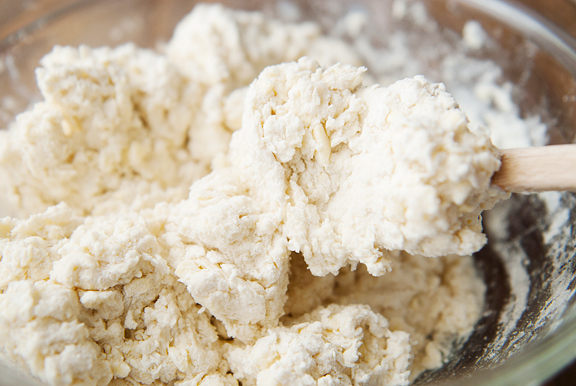 Add the butter to the flour mixture and toss with the flour to coat. Freeze for 10 minutes. 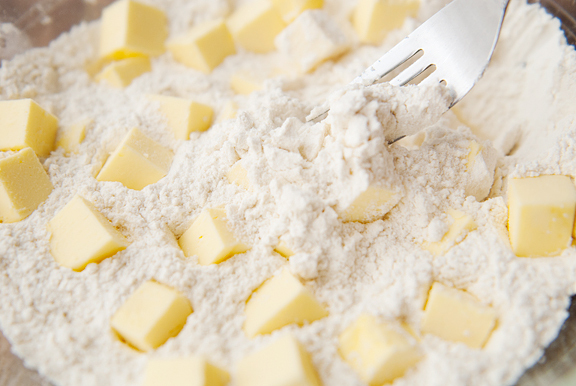 Cut the butter into the flour until the largest pieces are the size of a pea. 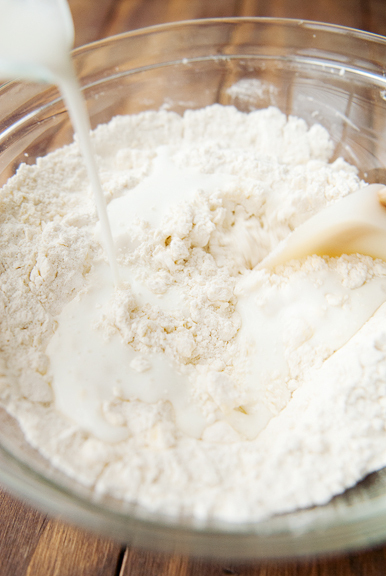 Drizzling the buttermilk into the flour-butter mixture and stir it until it is just shaggy and begins to come together. Turn it out onto a lightly floured work surface and pat the dough together into a 1-inch thick circle. 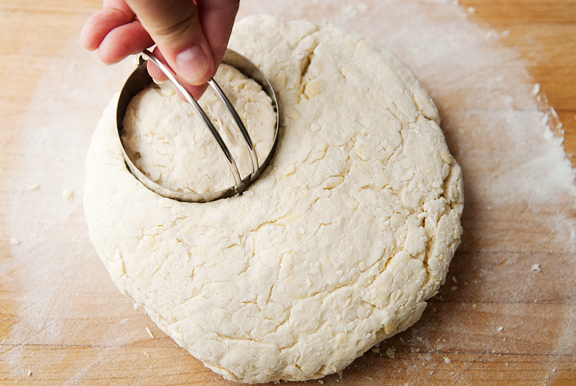 Use a 2.5-inch diameter biscuit cutter and cut straight down into the dough without twisting the cutter (twisting will prevent rising). Reform the scraps and continue cutting. This should yield about 8 biscuits. Set the biscuits spaced evenly apart on the parchment-lined baking sheet. Bake for 15-16 minutes until golden (careful not to burn the bottoms). 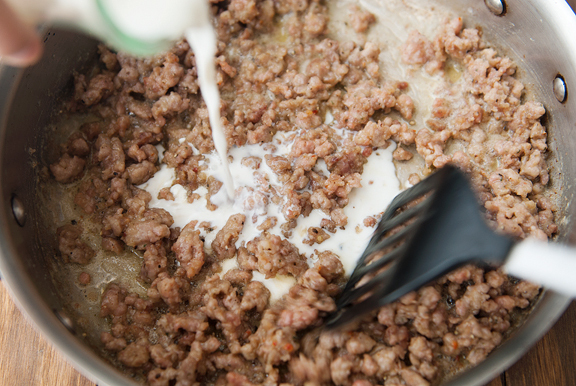 Make the gravy: Heat the butter in a large frying pan over medium-high heat until it is foamy. 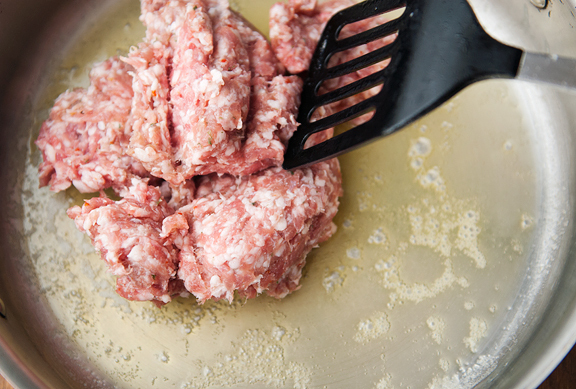 Add the sausage to the pan and cook, breaking up large lumps with a spatula or spoon. Cook for about 5 minutes or until any pink color is mostly gone. 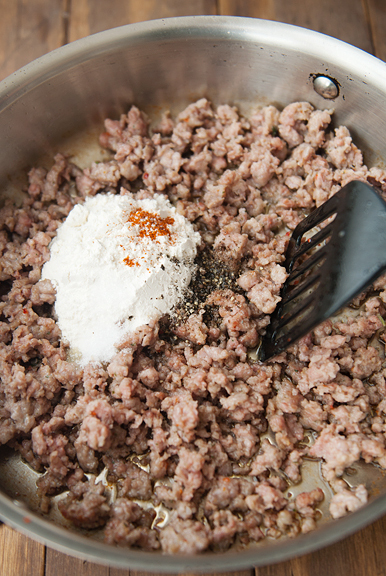 Reduce the heat to medium and sprinkle the flour, salt, pepper, and cayenne over the sausage. 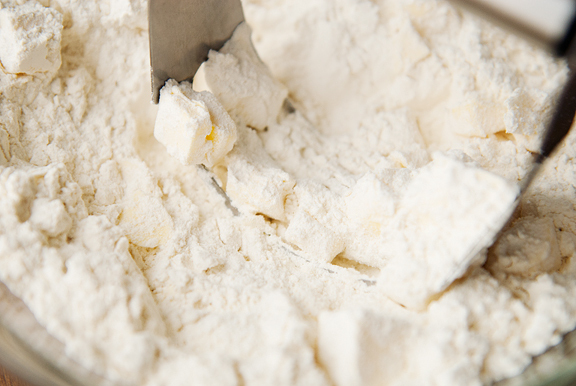 Stir it in for a minute until the flour is cooked. Gradually stir in the milk, scraping the pan to include the browned bits off the bottom. Let the milk come to a simmer while stirring occasionally. Continue to stir and let the milk simmer until it thickens (about a minute). Season to taste and keep the gravy warm. Serve: Split a hot biscuit in half and top with sausage cream gravy. If made ahead, you can lightly toast the biscuits and reheat the gravy on the stove top. Serves 8. I grew up with parents born in the early 1900s, from Arkansas, and I don’t think I ate biscuits and gravy (it’s good even w/o sausage) until I was an adult. It is a wonder Southerners don’t die in their 20s, cause no matter how bad it it for you, it’s worth eating very frequently. Glad you and Jeremy have been initiated. The next step is to change that gravy out for chocolate gravy. Chocolate gravy, biscuits and bacon. My family moved to Santa Barbara, Ca four years ago, but I grew up in OK. It’s funny watching my friends reactions when I tell them what all I used to eat growing up. 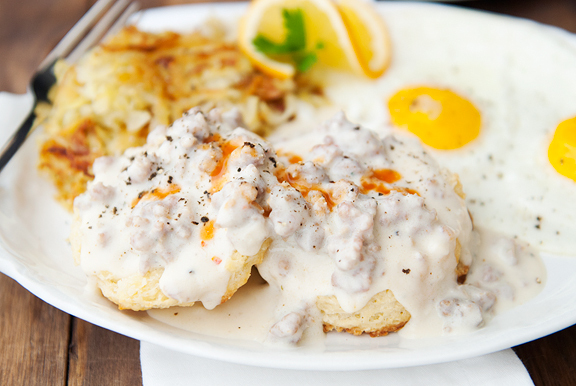 We never had biscuits & gravy until we moved to Kansas City, where it is quite popular. It can be tasty or pasty, but I’m sure yours is fabulous. Made the apple cider ice cream this weekend…yum! Thanks for that recipe! I am salivating after looking at your photos, Jen. And it’s not even 9am yet (and I’ve already eaten breakfast). This looks divine! Oh my….my friends in Southern Illinois would be drooling over this plate of food. Me? Skip the gravy and put butter and thimbleberry jam on the biscuit. MMMMMmmmmmmmmmmm. You and your ever loving look so happy in the snow! Looks so good. I’m a little jealous that you’re already in CB (as I write from my desk), but I hope you two are having a fabulous time. Happy skiing! Made these biscuits today to great reviews! Did not make the gravy as I didn’t have whole milk on hand, but I look forward to adding that next time. 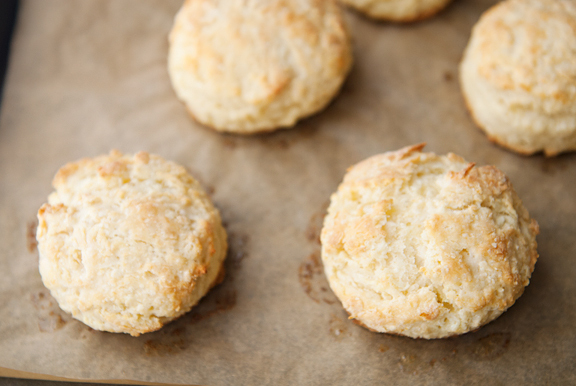 These biscuits are not only easy to make…they are so buttery and flaky. Thank you. Just discovered your blog and love your posts and your beautiful photos. Keep ’em coming! Yum! I need to try this. Oh, and I guess I should feel honored to be your inspiration here. Hahahaha. Looking forward to some of my own bisquits and gravy until the next time I get back to Kate’s Place! CB looks awesome in a blanket of snow. Maybe someday I will come out for a winter visit! Keep up the delicious-ness. OH MY that is the most magnificent plate of food I have ever seen. And I have been reading URB for like, a really long time :) Beautifully done! I’m making mine with vegetarian sausage, but…. the biscuits will be so good it won’t make any difference. YAY! Best picture of you two. Love the snow shots, thanks! 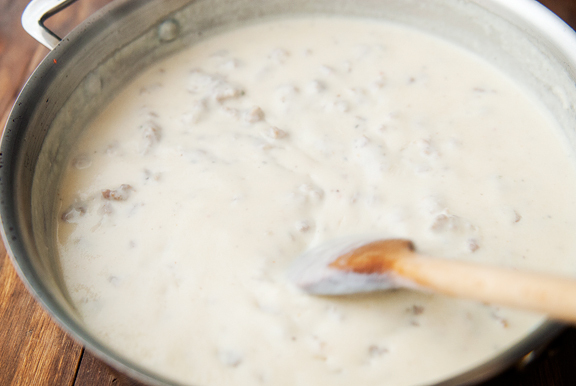 I’m one of those who just can’t stand the thought of sausage gravy. It was a very popular breakfast item years ago during my waitress days in Austin, TX. This yankee just could not figure out why someone would ruin a perfectly good biscuit. I’m sure yours is the absolute best though! Happy Thanksgiving, happy skiing! Looks fantastic! Also, a suggestion from your neighbor to the south–I have found that if you add in some diced green chile while you’re sauteeing the sausage, it makes biscuits and gravy even more heavenly! I made about 30 of these for Thanksgiving. I was SO glad when you happened to post a biscuit recipe right when I needed one. I made the dough Tuesday evening and baked a few Wednesday morning just to check (I was hungry too). They are wonderful, although I did feel the taste of baking powder was a touch too present. Which was easily banished when I topped with butter and cranberry relish. I cut the rest of the dough and put them in the freezer. When I baked on Thursday, I brushed a sugar and buttermilk wash over them and popped them in a steamy oven still frozen. Oh my god they were perfect. The buttermilk wash made a really nice sweet and tangy crust. Loved this recipe. And it was soooo easy. Thanks! Hope you had a happy Thanksgiving. Amy – whaaaaa??? I’ve never heard of such a thing, but that sounds crazy! Wow! Eva – it’s quite good. I try to only eat it on rare occasion (or if I’m really exercising A LOT)! Sara - Isn't it awesome? And they're so nice there! Jen - whoa. That sounds AWESOME. I'm pretty sure Jeremy would be over the moon with that addition! Stephen - great! I honestly haven't tried the biscuits on their own, so perhaps the baking powder might need a little scaling back, but they're definitely good with "other stuff" served on top (or the side). Happy Thanksgiving, to you! A true Southern staple in my family. I grew up in southwestern Virginia in the mountains. Funny thing, though, I didn’t learn to make great biscuits. I’ve printed your recipe and plan to try it soon!